SMEDAN/NNEW are organizing a FREE 1 day workshop on Financial Management & Export Opportunities. 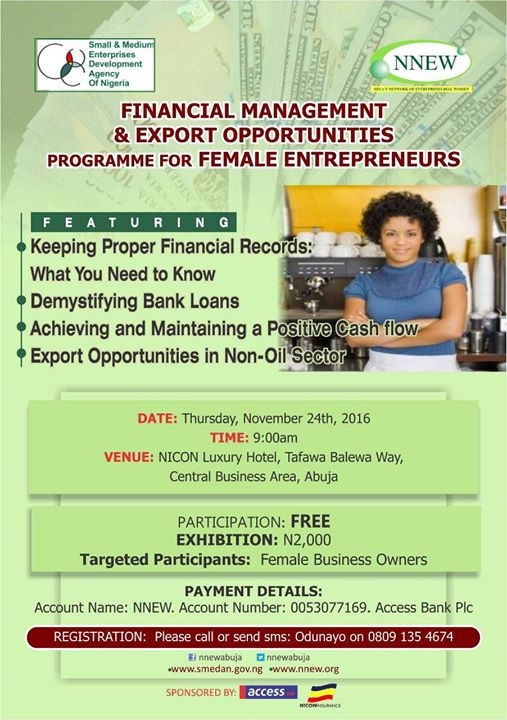 Learn how to demystifying bank loans, Manage Your Biz Finance, Export opportunities in Non-oil Sector, Achieving and maintaining a positive cash flow, etc. Date: Thur, Nov, 24, 2016. Venue: Nicon Luxury Hotel, CBD, Abuja. For more info call or text 08091354674.